SYNOPSIS: A striking portrait of drifters and seekers in post World War II America , Paul Thomas Anderson's THE MASTER unfolds the journey of a Naval veteran (Joaquin Phoenix) who arrives home from war unsettled and uncertain of his future - until he is tantalized by The Cause and its charismatic leader (Philip Seymour Hoffman). REVIEW: Every so often a movie comes along that evokes mixed emotions and causes one to debate the relevance of the storyline. One can undoubtedly question the meaning and purpose of Director PT Anderson’s (There Will Be Blood, 2007), overall objective of this project. The heavy overtone jab, at the well-known celebrity-filled religious-sect affiliated with modern science, is in-your-face obvious from start to finish. Some might argue that like the real-life story, this flick portrays a story rooted in power, corruption, and deception, and is obviously a cautionary tale of what happens when we put our faith and trust into the wrong hands. This is an emotional (and somewhat disturbing) drama, that caused me to think of the two leading characters as being not unlike the twisted (late) Reverend Jim Jones and his possibly meeting an alcoholic version of Forest Gump, by twisted fate. 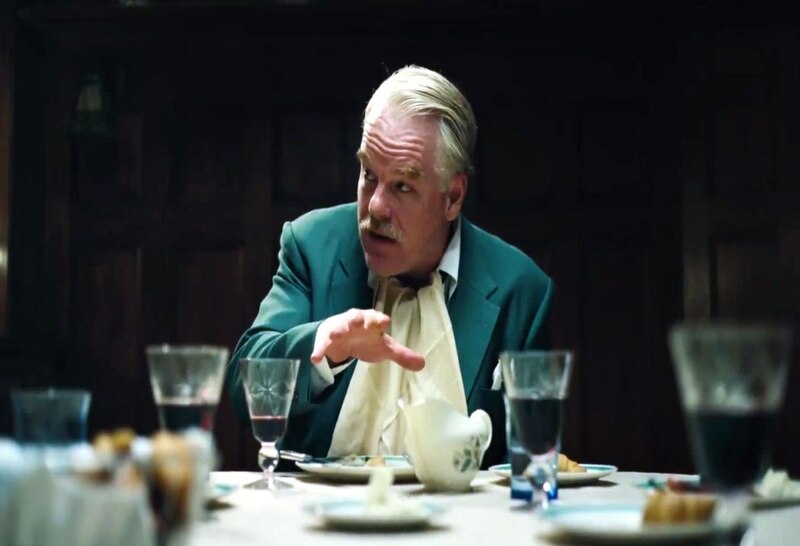 Amongst many colorful and interesting characters, there are two extra ordinary stories in The Master: Firstly, there is that of the character Freddie Quell, played by Joaquin Phoenix, who finds himself in emotional ruins at the end of the World War II. Seemingly as a result of what we now know as PTSD (Post-Traumatic Stress Disorder), Quell will drink anything available that will give him a ‘buzz’ and seems to prefer most non-palatable liquids such as paint thinner mixed-up with other less potable substances. The other interesting character is that of Lancaster Dodd, played by Phillip Seymour Hoffman, who happens to be the author, founder and leader of what is referred to in the movie as “The Cause.” Hoffman’s character wanders between the houses of his followers, whilst composing his books, giving well choreographed lectures on his practices, and in turn, we see in great repetitive detail, how a new religion emerges. As a backdrop to the story, Anderson does a great job illustrating a transitioning America, with its less complex pre-war days and the rapidly shifting world that waits. This interesting dynamic to the movie is both haunting and beautiful at the same time and brings out the best in the cast. Their performances were even more moving than the actual storyline. I could not prevent myself from being enveloped in each and every character that graced the screen. I would venture to say that this is absolutely “Oscar-buzz” worthy, based purely on superb acting and an interesting plotline. Despite the movie’s complex plotline, this is a movie worth attending if you have longed for seeing great acting in very interesting roles and I enthusiastically give it four stars (out of five).